"At SP we have really, really done it! We've gone and built the WORLD'S FIRST SUPERCHARGED MGF - THE CHEETAH!! It's the car that every driver dreams about." And so they had. This was the first line on SP Performance's web-site, extolling the release of the superlative SP Cheetah. SP Performance - a subsidiary of Stephen Palmer Garages of Long Eaton, Nottingham had realised something quite extraordinary - a daring and risky plan: to build a truly high performance MGF, under a new sub-brand called "Cheetah". The SP Performance MGF Cheetah pictured at the 1998 Autosport show, Birmingham NEC. By the time of the Cheetah's launch, at the January Autosport show in 1998, Stephen Palmer had become one of the most successful MG dealerships in the country. It seems unlikely that Mr Palmer and his team would have become so successful had they not been attentive to their customers' needs and responsive to their comments. 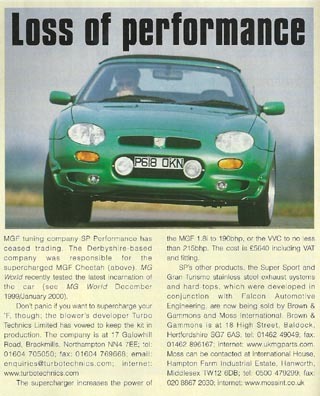 Listening to their customers' lead the team at Stephen Palmer to realise that there was a thus far unrealised need in the market for products that complemented and accentuated the strengths of the basic MGF product - and consequently, it wasn't long before SP Performance was born. Clearly, the SP sales people kept hearing the same story from their customers - the standard car sounds too quiet, and needs more of a sports car sound. SP themselves had no experience in fabrication, so instead they looked for collaborations with other companies with the skills required to fulfil their design brief. With regard to the disappointingly refined standard exhaust note (for a sports car! ), they went knocking on the door of Milltek - a well regarded after-market exhaust manufacturer. 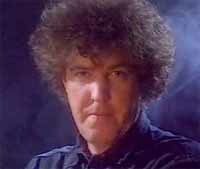 Jeremy Clarkson said that the SP Performance exhaust was fantastic. The opinion of anyone with hair like this is gospel. Obviously. Milltek did them proud - producing, in high quality stainless steel, the SP "Super Sports" exhaust system, with large bore, upswept "DTM" Style tail pipe finishers. Forget about the aesthetics - the system simply sounded sublime. Refined enough at motorway pace, on acceleration, the exhaust system simply wailed in a wonderfully tuneful and enthusiastic manner. In 1998, Performance Car (the tome that a certain young Jeremy Clarkson wrote a rather entertaining column for - long before he became famous on the BBC) wrote enthusiastically of this exhaust: "every MGF should have one!!!" Clearly, hundreds of customers thought so too - and now the SP Supersport is one of the most successful exhaust systems ever marketed for the MGF. SP Performance didn't stop there either - they went on to sell replacement filters, and a whole range of other performance and aesthetic goodies - all of which went on to be strong sellers. SP Performance felt they knew the market. And some of their customers were telling them that these bolt-on goodies were all very well, but how about some serious performance? That was a tough one - but SP felt that they could make the dream of a higher performance MGF happen - something that would cement SP as one of the premier suppliers of high performance MGs. And SP had learnt through their experience with collaborations with Milltek et al that they could work with third parties to help realise new product ideas, and turn them into profit-earning sales for the parent business. Perhaps they were looking enviously at the German tuning houses? 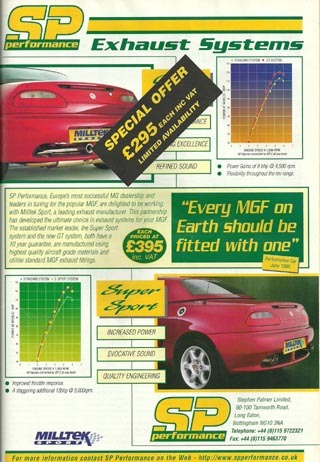 We may never know, but a series of events were triggered, events that would culminate in a new SP Performance product that would shock the fledgling MGF community - the launch of the astonishing SP Cheetah. There is clearly more than one way to extract power from an engine, but from the outset SP Performance were seeking for a substantial power gain, yet they wanted the car to remain tractable and easy to drive and easy to service by maintaining compatibility with Rover's "Testbook" diagnostic hardware. This immediately ruled out a conventional, normally aspirated, tuned engine with its peaky power delivery and need for alternative an engine control unit (which would not be diagnostic compliant and represent an integration problem with the standard fit alarm and immobiliser). Forced induction could be an option - so SP got on the telephone to talk with one of the UK's best known Turbo specialists - Turbo Technics of Northampton. However, Turbo-charging has two disadvantages. One is throttle response - catch a turbo "off boost", the car will feel sluggish, before the power returns in a punch to the kidneys proportional to the state of tune. 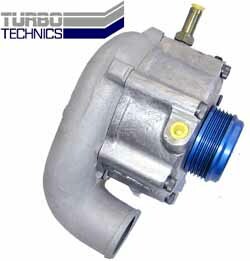 A good turbo installation can largely ameliorate this lag, but there is no doubting that a turbo will never have the sharp responses of a normally aspirated engine. The other disadvantage is even more critical for the MGF. Heat. A turbocharger gets extremely hot, and under bonnet temperatures soar as a consequence. This becomes a real problem when the engine, like that in the MGF, is in an enclosed steel box in the middle of the car with little airflow to vent the excess heat. But Turbo Technics had an answer: a hybrid modified turbocharger with a specially adapted gearbox driven from the crankshaft pulley mated together to create a centrifugal compressor - the Rotrex Supercharger (pictured right). With instant induction boost from any engine speed, and potentially much cooler engine bay temperatures over the turbocharger alternative, this was clearly a winner for the MGF package - and this is how SP decided to specify their Cheetah. With an additional ECU to control an additional pair of fuel injectors to cover the engine's increased appetite for air and fuel, the conversion retained the car's standard ECU. This was great news: so all the standard anti-theft equipment remains operational and untouched, and the car could continue to be serviced by any Rover service agent. Krafthaus-styled GRP body kit, consisting of wheel arch extensions, front and rear bumper and sill extensions. Coupled with AZEV wheels, it completed a distinctive look for SP's highly modified MGF package. The bad news was cost: the Turbo Technics kit added a cool £5000+ to the price of a new MGF. Would buyers be prepared to pay that much for a car that looked standard? This lead SP to talk with Krafthaus - a Midlands-based styling house with a history of successful projects for companies such as Bentley and Jaguar. Krafthaus stylists worked hard to produce a stylish and distinctive bolt-on styling kit, with wheel arch extensions and a generally more muscular and aggressive stance on the road. It would be difficult to deny that they were successful in this aim. Now the problem was that the standard 15" wheels looked somewhat puny under those exaggerated wheel arches. No problem: SP specified a set of AZEV 17" alloy wheels which subtly increased the track of the car, filling out the arches, and completing the Cheetah's unique appearance. The look was almost there. But no self-respecting car tuner can avoid putting some badges on the car - and SP were no different. But SP did go one step further than most - they specified a new set of instruments featuring, incredibly, a pair of glowing 'Cheetah eyes' on the green-faced rev-counter! It certainly represents a surprising and unique feature of a full-works SP Performance MGF. With the look and the performance practically sorted, what of the chassis and the brakes? Here, the changes were surprisingly modest. Standard (240mm) brake discs were retained, albeit specified from Rover Sport and Racing, and these were coupled with Mintex brake pads - offering greater resistance to fade compared with the standard faire. As these were the same rotors used on the MG Maestro Turbo, perhaps it was felt that these brakes would be adequate for the Cheetah? There was no sign of 4-pot calipers or monster sized brake discs that might otherwise be expected on a vehicle of this kind of performance potential. On the chassis front, the shock-absorbers remained standard, but the hydragas spheres were changed for the Cheetah - using the competition units specified for the French MGF Race series - and thus offered stiffer springing and firmer damping. And other than a few other minor details, this is how the SP Cheetah was finally specified. With so many choice components on a single car, you'd expect the whole to be the extra-ordinary product of the sum of all its parts wouldn't you? And in some ways, the car didn't disappoint. You certainly couldn't argue with the performance: the VVC version of the car (you could also buy a supercharged 1.8Mpi version for a small 25bhp performance penalty) provided an astonishing 215 bhp and 185 lb.ft torque, both peaking near 6000rpm. Despite the high rpm torque peak, the engine is a good deal less peaky that the numbers would suggest, with meaty stump-pulling torque evident throughout the rev-range. This muscular performance provided the MGF with a 0-60 time of 5.5 seconds (nearly 2.5 seconds faster than the standard car), a 0-100 of 12.9 seconds and a top speed that was artificially limited to a staggering 150mph! The styling? Well, the instrument pack wasn't to everyone's taste, but you didn't need to buy that, and the same applied for the body kit and wheels - but there is no denying that the car looked the part. In the right colour, this was one menacing beast with the near super-car performance that the SP Performance web-site rightly boasted. On the road the car wasn't bad either - with magazines being broadly approving of the cars manners. Sure the ride was harder than standard - but then what do you expect with huge 17" rims and liquorice-thin rubber wrapped around them? The car provided safe, sure-footed fun - and was a terrific point and squirt machine. But out and out adulation escaped the Cheetah - and one doesn't have to look too far to find out why. The complete Cheetah package would set you back a cool £29,500 in 1998… and because of the position of the supercharger, there was no air-conditioning. The sticker price set expectations to a level where the Cheetah's humble MGF origins simply could not support. The interior, which served the basic £17,000 roadster so well, looked, well, cheap for a £30,000 motor car. There was a lack of the aforementioned air-conditioning (arguably less of a liability then than it is in today's market), and somehow, the underpinnings appeared somewhat under-engineered (although whether this was the reality is open to debate). So now SP Performance had a very audacious and ambitious product to sell. Unfortunately, unlike the bolt-on items that SP had sold successfully, the Cheetah propelled them into a market that the sales team were perhaps a little unfamiliar with. It is unclear as to exactly how many SP Cheetahs were built in their full body-kitted and Cheetah-badged glory - but rumours were that only five were built to the full specification. Customers who were put off by the styling could purchase the engine modifications alone - and a number more cars were either sold or converted after sale in this way - the Supercharger installation alone costing an eye-watering £5600. And so, for the next two years, SP Performance continued to work hard to sell their unique creation. At the many shows that the company attended, there is no doubt that the car gained considerable attention - but again and again, cost was the primary barrier to greater sales. It seemed that there was a threshold at which MG buyers were prepared to spend for or on the MGF - and £30,000 comfortably exceeded that limit. 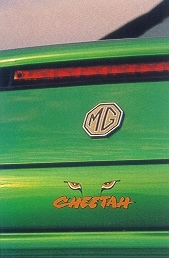 Perhaps the Cheetah's sales failure may have played a part in spelling the end to MG's own Supercharged MGF - the Supersports, the concept of which was first seen at Geneva 1998 - a car that was also expected to cost in the region of £30,000… Lucky for MG then that SP Performance performed their market research for them. Unfortunately, the loss of the Rover franchise effectively spelled the end of SP Performance and the Cheetah. Stephen Palmer Garages went on to take up a TVR franchise, but sadly the company went to the wall within a year or so of the end of MGF sales from their Long Eaton premises. A sad end to both Stephen Palmer Ltd and to SP Performance. Fortunately, the SP legacy lives on: you can still purchase the SP/ Milltek Supersports and related GT exhausts from MGF specialists, Brown and Gammons - along with the front aerodynamic splitter, that was pioneered on the Cheetah's body kit. The body kit moulds also remain in existence, now owned by British Motor Heritage following the collapse of Krafthaus (whose demise was unrelated to the collapse of SP). Even the supercharger conversion remains available as Turbo Technics themselves continue from strength to strength; the Supercharger kit was an unexpected hit amongst Lotus Elise owners. Consequently, the supercharger installation has undergone much development over the years, becoming more reliable and even more powerful in the process (270-300 bhp anyone?) and remains available for installation on the MGF and TF. At SP we have really, really done it! We've gone and built the WORLD'S FIRST SUPERCHARGED MGF - THE CHEETAH!! The world famous automotive designer's KRAFTHAUS have restyled and enhanced the curvaceous MGF, revealing an aggressive, lower and wider stance. Masculine! Poised for Action! SP Performance exhaust system that sounds great and provides a 12% power increase @ 5,000rpm, over the standard mild steel system. Hydrogas Special Race Suspension to optimise handling, reducing roll & pitch sensitivity under braking - all without compromising ride quality. Maximum Braking with competition discs, Mintex high-friction anti-fade brake pads & Bosch ABS system. This monster combination gives the driver complete control in harnessing the power of the Cheetah. The SP Performance Cheetah has been created to convert the car that everyone always wanted into a car every MGF owner dreams about. The Cheetah specification has developed to deliver ultimate drivability, let us prove it to you by taking a test drive! Price £29,500 inc VAT. - The Affordable Supercar! Turn in, clip the apex and squeeze the throttle - dial in opposite lock and revel in a gloriously progressive power slide. Yes, the SP Performance blown MGF is staggeringly quick, but raw power is nothing without control. A brand new advanced design of supercharger, mated to either a 1.8MPi or VVC K-series engine, delivers a deeply impressive 190 or 215 bhp respectively. The smooth, yet instant power delivery complements the MGF package like nothing else. Work that superb MGF chassis and explore the limits of adhesion - in total control. The GT SP Performance exhaust system, a further addition to the range to complement the popular Super Sport, has been developed to meet the needs of our more conservative MGF enthusiasts. This is, undoubtedly, for the driver that prefers a slightly more refined exhaust note, but still wants to stand out from the crowd with a piece of engineering that looks stunning. The enormously popular Super Sport exhaust, offers you the ultimate race bred system for the road. A truly evocative sound with the phenomenal power gains and the stamp of Milltek Sport, quality engineering. Stephen Palmer Ltd. trading as S P Performance. of Long Eaton, Nottingham sprang a suprise with their 150mph Cheetah MGF "supercar", set to do 0-60 in 5.5 seconds with its Turbo Technics Rotrex supercharger. Suspension is uprated as used in the French multi discipline series, brakes are competition spec. with ABS by Bosch, and the wheels are 17" with A520 Yokohama 215/40 tyres on the front and 215/45s on the back. The body styling is by Krafthaus, giving the low, aggresive stance of the car extra bite, as befits its name! Due to have been formally announced in February, it is retailing at £29,500. These photos show a pre-production car. This company did a lot to pioneer the turbo conversion business in the UK. More recently they have come up with a turbo compressor wheel driven by belt via a special gearbox. Basically the TT supercharger is a turbo driven at 120,000rpm by a belt off the crankshaft. There are some disadvantages to this system over a turbo but there are also two major plus points. First there is no exhaust heat to cope with. I for one am not too happy with the idea of a cherry-red lump of cast iron glowing away under the bonnet. Better still the drive to the compressor wheel is direct. You get the same boost, at the same rpm, every time you open the throttle. 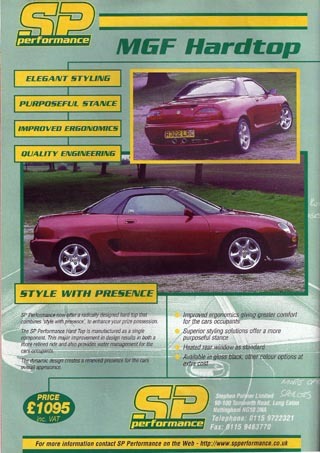 Above: the SP MGF Hardtop, more recently described as the "Heritage Hardtop" - they're one and the same.